You might have observed people carrying a peculiar bag to their work. Some even take these on road trips. These are the meal prep bags which are primarily used for storage of food. 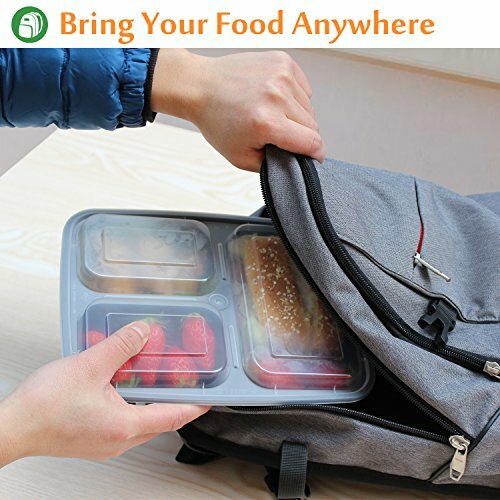 People who want to consume home food at their workplaces or who would like to carry home-cooked food wherever they go, these meal prep bags come in handy. They are not designed only to store your food. A best meal prep bag is insulated appropriately to keep your food warm (or cold) without altering the condition and taste. It is easy for carrying convenience. We have analyzed some of the best products for you, and it will help you to select the right one. What is a meal prep bag? Why is it necessary? A meal-prep bag is used to store food in individual containers which can be carried or taken anywhere. 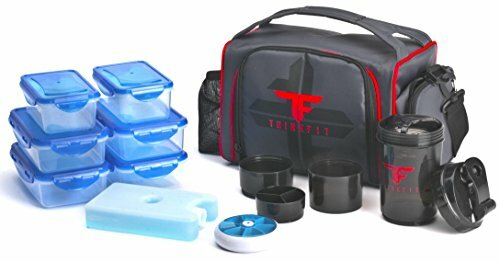 Other names for meal prep bag are a lunchbox, food box, etc. They are primarily used for storage of food. With ever growing busy schedules, people who work out of their homes it became difficult for most of them to travel back home for lunch every day. Hence the idea of meal prep bag. It was designed with an intent to carry food the person’s workplace. In the early 1900s, these boxes are woven or made of wood which is used to carry various types of food such as boiled eggs, meat, and other liquid beverages (ex: coffee). Thermos introduced vacuum flask which revolutionized the meal prep bag industry. Its ideal function being the ability to hold the food in optimal temperatures (hot or cold) until lunchtime. Later after several phases of innovations, the most widely used material in meal prep bags is plastic or vinyl. They are made for ease of transportation and their versatility. Some of them are made by incorporating foam insulation methods with the interior made of aluminum or vinyl. The first answer is Health. With our busy lives, it is always not possible to eat healthy food. Setting healthy eating goals and following them are entirely different. You might not ever eat healthy from outside. For this very reason, people opt to carry their food in these bags to their workplace or wherever they are traveling to. Homemade food can eliminate the junk, preservatives and other additives (which are carcinogenic) and keep you healthy. They help you not to waste food. It will make you accustomed to the habit of eating the entire food present in your box. You will save lots of money because they will eliminate the need for eating food outside. You can’t rely on ordering food every day from your nearby hotel or a fast food center. Most workaholics will eat a lot of junk foods and high-calorie foods at their workplace. With meal prep bags you will eliminate all these habits which are healthy as well as saves you the buck. It will help you to add different varieties of foods to your menu. Eating the same food every day will not be appealing. Having a meal bag inculcates the habit of trying different types of food and also enables you to follow a balanced diet of proteins, carbohydrates, and fats. Now that you know what a meal prep bag is and its uses let us dwell into the list of some of the popular products available in the market. This guide will help you in selecting a meal prep bag suitable for your life style. The first product on our list comes from the company called Evolutionize. It contains a three bisphenol (BPA) free food containers, and one non-toxic gel pack. All the boxes are a freezer, microwave, and dishwasher safe. The bag is large and contains room for accommodating the fourth container. Its mesh pockets are expandable to fit in extra accessories. The entire kit is suitable for carrying three full-sized meal boxes and two full-sized protein shake bottles together. The top shelf of the bag provides additional space. Side mesh and pockets can be used for carrying snacks such as bars, nuts, and fruits. The shoulder strap of the pack makes it easier to carry. One of the concerning issues with the box is that it will become cumbersome to accommodate the additional fourth box. It does not allow four medium or full-sized boxes to fit in. You must compromise on the size of the boxes if you intend to carry a fourth one. The unit is made with durable materials with super thick PEVA inner lining and EPA foam which helps to keep the food at optimal temperatures. The bag is also made from ultra-high-quality polyester which is sturdy and will survive for more extended periods. One of the best perks of EDC meal prep bag is that the bag contains individual compartments for the boxes and all the chambers are insulated individually. A meal prep bag must not suit for a certain age group of people. It must be suitable for everyone, and this is where ThinkFit will aptly fit in. It is designed to suit both children and adults. Coming to specs, it contains six meal boxes which are freezer and microwave safe. They are also dishwasher safe saving your cleaning time. Like the EDA, ThinkFit also has a shoulder strap for its bag making it easy to carry. The package includes six meal boxes (four 2.5 cup serving size, two 1.5 cups serving size), one shaker cup with three storage containers, one push button vitamin pill box with seven compartments, and ice pack. The double insulation system maintains the optimal temperature of the food until your eating time. All the boxes contain four-sided snap lid design. The ThinkFit bag is durable and has double stitched strap handle to avoid mechanical wear and tear. The containers are leak proof which prevents accidental spill and also preserves the aroma/taste of the food. The bag contains a side zipper pouch for holding a water bottle or protein shakes. 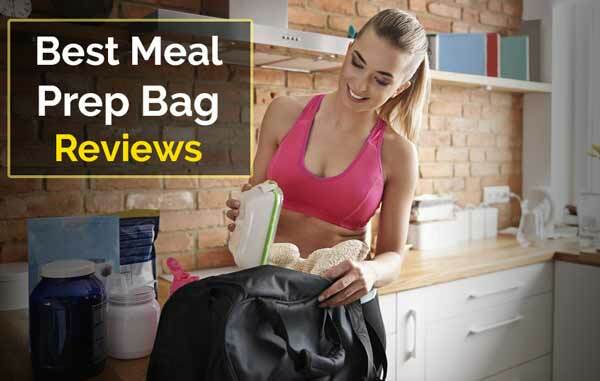 All these items and features make it one of the versatile and best meal prep bags in our list. It is best suited for all age groups of people, i.e., adults and children. A high-quality compartmental meal storage system provided by Isolator Fitness is probably a top-notch quality product in our list. It keeps your food at optimal temperatures for 12 – 16 hours. The bag consists of individual compartments to accommodate different sizes of meal boxes. All the compartments are well insulated. You can also store stackable food trays within the bag. Isobag has two zippers, meshed exterior pockets for carrying snack bars, and an additional insulated pocket with small mesh pocket in the lid on top of the bag. The top pocket is ideal for storing a single meal or your vitamin pills. The package includes 12 stackable food containers. These containers are BPA free, leak proof, microwave safe, dishwasher safe, and can be recycled. It also includes six different sized meal boxes. For maintaining cooler temperatures, Isobag has three ice brick packs which they call them as ISOBRICKS. To carry the bag, it has a padded shoulder strap and a carrying handle. Though it is a bit expensive than other meal prep bags, it is worth it because you will get additional perks such as a cookbook for recipes and a 200 plus pages meal prep encyclopedia. The downside of the product is that the boxes provided in the bag are not of superior quality. You may need to replace them after a few months of use, and Isolator fitness sells individual boxes. 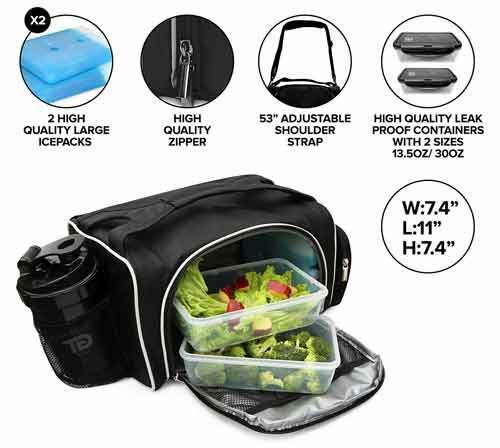 A compact design which accommodates up to seven meal boxes is the Evolutionize healthy meal prep bag. Unlike the EDC meal prep bag, this one has a single compartment in the bag. You can stack all the seven boxes (which are of different sizes) at your convenience. 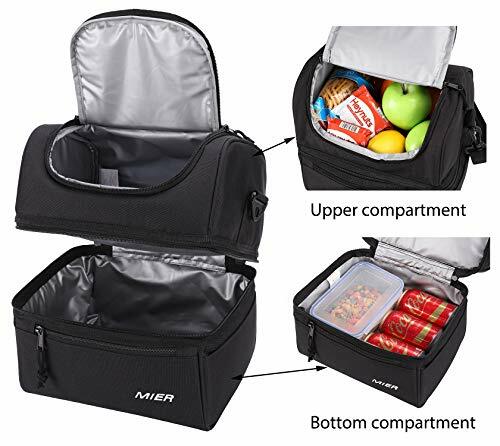 It is the best meal prep lunch box suitable for your workplace. The containers are BPA free and CFC (chloro-fluoro-carbons) safe. The entire set is made with FDA (Food and Drug Administration), and CFIA (Canadian Food Inspection Agency) approved materials. So, you need not worry about the safety of your food. The downside of this product is it does not supply the insulated bag. You need to buy the bag separately. Evolutionize provides an eBook with the purchase which includes cooking recipes and tips. The containers are perfect for storing and heating quick meals. Although the lids can be used in the microwave, it is advisable to use without them. Since the package does not include the insulated bag, the product is quite cheap than other products. If you don’t store food for more extended periods and are looking for a quick meal, this product is for you. TO GO, a very peculiar name but the product isn’t. The meal prep bag by TO GO is a premium ranged product with durable and superior meal boxes and bag. It contains six meal boxes of which four are medium sized, and two are small sized. The package also contains a leak-proof shaker and pillbox. Its pillbox contains seven different compartments for weekly management. The shaker measures 23 oz and is spill/leak proof. You can carry your favorite protein shakes and beverages without the fear of leakage. All the containers are made from food-grade plastic which is BPA free. The boxes are a freezer, microwave, and dishwasher safe. For carrying these boxes, their elegant bag comes with shoulder strap and a handle. With the purchase, you will get a special introductory two ice packs. These ice packs can be used to keep your cold beverages at their ideal temperatures. With the To GO insulated lunch box you will get 100% guaranteed satisfaction. If you aren’t, they have a full refund policy. The unit is cheaper than its competitors making it one of the budget-friendly meal prep bags on our list. The name FitPak (fit-pack) suits aptly to this set because it fits multiple lunch boxes in a compact space. Its portion control system helps you to eat healthier amounts of food both quantitively and qualitatively. Fit & Fresh six meal box system will become your perfect meal partner on the go. 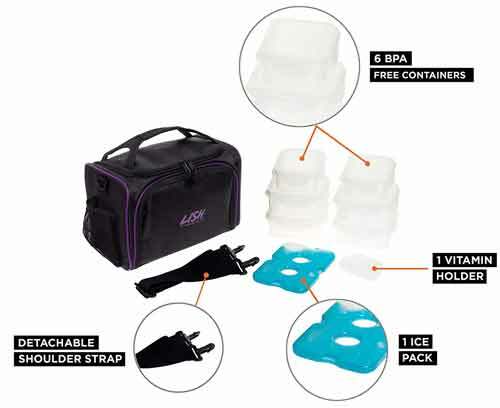 The unit includes everything you need, one insulated bag, meal boxes (cups), shaker bottle, ice pack, and vitamin case. One of the unique features of this meal bag is the protein shaker. It is a patented product by Fit & Fresh which will mix the protein powder with ease. The shaker does by a unique technology known as Jaxx Agitator. All the items, boxes and shaker are spill and leak proof. The boxes are a freezer, microwave, and dishwasher safe. FitPak bag is made durable quality materials which are well insulated to keep your food at your desired temperatures. There are two ice packs included in the package for storing your cold beverages. The shaker and icepacks must not be used in a microwave; else they will be damaged. A durable handle on the middle top of the bag helps you to carry wherever you like. Sadly, there is no shoulder strap for extra safe handling. 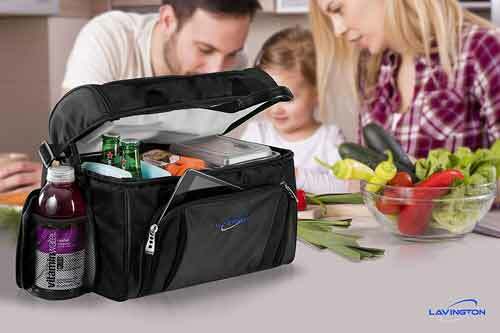 If you have your own set of meal boxes and are looking for an insulated bag which keeps your food at your desired temperature, Lavington insulated cooler bag is for you. The bag was initially designed for the aviation industry to carry food over a long distance. It was used by air hostesses, pilots, and other flight crew members to carry store and carry their food. Soon they became quite popular because of the ability of the bag to withhold the optimal temperatures of the food. Now, they are manufacturing these bags for consumers who like to carry it along with them. The bag is designed to fit multiple food boxes or bottles, and yes, it is huge. Its intimidating size is perfect for frequent travelers and vacations. You can also carry it for other outdoor activities such as hiking, gym, work, and adventure trips. The bag is made by using the most exceptional quality of 1680D polyester with PEVA lining. It consists of heavy duty, durable pullers, and zippers. The bag has plenty of space and separate containers to fit full meal boxes. It is insulated to maintain the required temperatures of the food. One of the major flaws of this bag is that it does not provide any food containers. It is also designed to store cold beverages rather than hot food items. 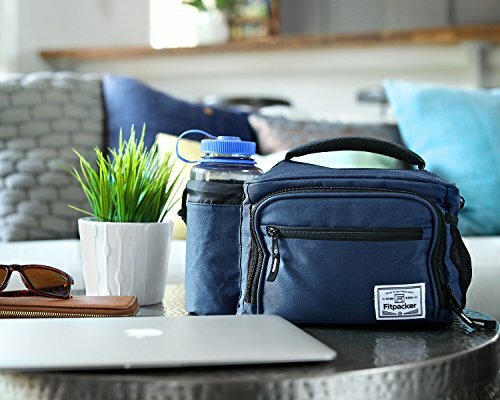 Nonetheless, if your priority is to store your protein shakes or other cold drinks as cold as they should be, Lavington insulated cooler bag is the right choice. Are you finding it challenging to carry cold and hot boxes together or looking for a system which can provide you with different sections for carrying hot and cold items, MIER is there for you. Its double deck system enables the user to store cold and hot items according to their preference. Additionally, there is a separate pouch on top to store your favorite snacks and bars. The bottom container is for storing cool items whereas the upper deck is for hot foods. There is a zipper pouch in front for carrying utensils, napkins, keys, and other additional stuff. The interior of the bag is very well insulated and has PEVA lining. For easy carrying, there is a shoulder strap and a handle. The shoulder strap is detachable, and you can remove it if needed. The package does not contain any meal boxes which means you need to buy them separately. You must also be very careful about the dimensions of the boxes before the purchase. Certain medium or large boxes may not fit in the bag. It is also designed for adults only and is a unisex design. Irrespective of the inclusions, it is an excellent bag for travelers especially if you are on a picnic or vacation. If you are looking for a meal box system which contains a wide variety of options and supports various portions of food, Enther is for you. It includes twenty different sized boxes. It means you can use it for adults and kids. The material used to design the boxes are very durable that they will last for many years. You need not worry about scratches or cracks on the lids and boxes. All the boxes are made from BPA free materials. They are microwave, freezer, and dishwasher safe. Some of the boxes (out of 20) have compartments in it which helps you to store different types of food in a single box. The matching airtight lids add beautiful attire to the containers. Compartment system helps to you to have a healthy and controlled diet. This unit is suitable for a family, especially when you are on vacation. The boxes are stain and odor resistant. They are also re-usable. 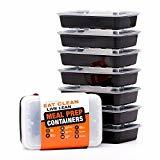 The Enther meal prep containers do not provide any bag to carry their boxes. These boxes may hold your food at desired temperatures for more extended periods without the bag. You must buy a bag if you intend to store the food for more extended periods. Simplicity will make things great. But there is a misconception that simple products are not crafted with care. On the contrary, they require utmost attention. Simple products are very complicated to design. 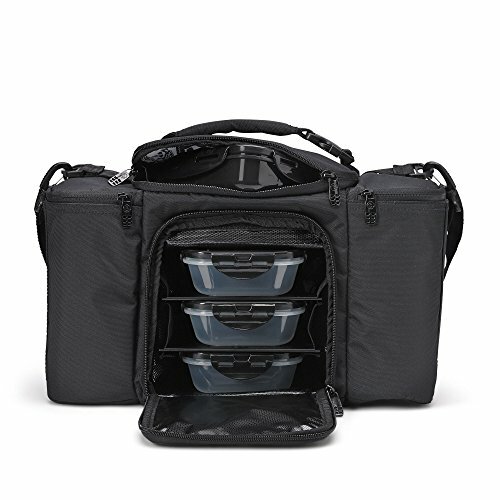 innovator 6 pack fitness 300 stealth meal management bag is one such simple product with a great set of features. It consists of an insulated core system which can hold three full meal boxes. The package includes three containers which contain snap lids. These containers are independently accessible. The patented shelving system enables easy accessing of the boxes. There is a large sports nutrition container within which you can sore your pills or energy bars. Two gel packs which are included in this package helps you to keep your food fresh for more than 8 hours. The side pockets are adjustable and are insulated too. These side pockets are large that they can hold up to four water bottles. The interior of the bag has a cool tech lining to preserve the food for more extended periods. 6 pack fitness stealth bag is made of a durable 600D polyester which is stain and scratch resistant. The shoulder strap helps you to carry the bag with you. Sadly, there is no handle, and the shoulder strap is the only option for you to carry. A bag exclusively designed for gym enthusiasts and travelers to carry their meal boxes is the Expedition 300 stealth by the company known as 6 pack fitness. Does it support to carry only lunch boxes? No, you can also carry your other gadgets such as a laptop or tablet. The bag has their patented shelving system which makes the user easy to keep and remove the boxes individually. You need not remove all the boxes to take out a particular box from the bag. The bag is compact and is not bulky. It is made of superior quality polyester known as EnduraPoly. This particular material is very durable and is water and stain resistant. Other prominent features of the bag are, an insulated core system which holds 3 to 5 meal boxes, utensil, and supplement zipper pockets, removable meal core, 20 oz sure seal containers, and one travel size supplement container. The anti-condensation side gussets of the bag will not collapse the bag it is empty. It contains EVA lining to keep the food hot or cold. There is a free-lined pocket to protect sensitive materials such as sunglasses. Additionally, there is an exterior zippered pouch to hold a water bottle or a shaker. There are three gel packs included which will keep your food cold for 8 hours plus. For easy carrying, there is a buckled and adjustable sternum strap. It also adds extra stability to the backpack. A healthy meal prep bag should help you to save money and eat healthier food in your day to day life. 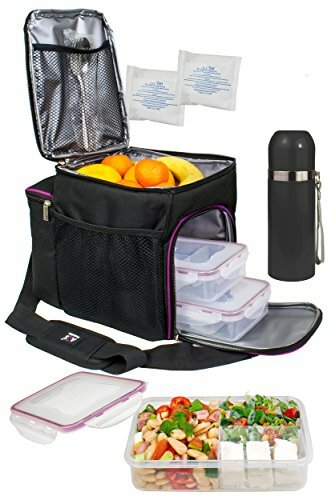 Prep naturals meal prep bag ideally fits into this criterion. It is a highly compact and versatile system. You will get multiple compartment systems which help you to keep your food organized. There are side pockets on the bag to store your water or shaker bottles. Additionally, you will get ten cutlery sets, and each set comprises of a fork, spoon, and napkin. The package contains ten food container boxes which have a single compartment. 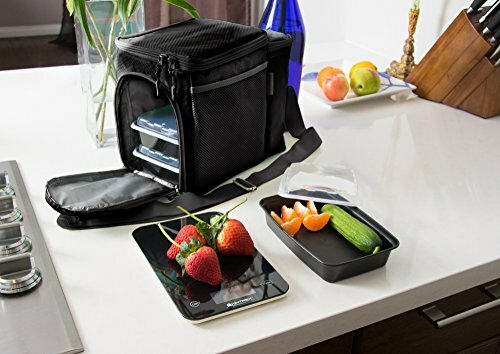 You can carry your food on the go with this meal prep bag. The boxes are made from BPA free, food grade plastic materials. All the items, i.e., the cutlery and the boxes are made by FDA and LFGB approved materials. You need not worry about food contamination, and they are re-usable. They are microwave and freezer safe too. Coming to the bag, it is made of highly durable polyester which has a thick PEVA lining. For additional enhancement, the bag has bolstered with EPA foam. It makes the bag as strong and durable as metal hardware materials. The shoulder strap helps you to carry it wherever you want to. There is no handle, and you have to rely on the strap only. Made in a compact design, A2S complete meal prep lunch box has everything you need. It includes a bag, meal boxes, insulated beverage bottle, ice pack, and a set of cutleries. You can carry this set everywhere you want, and its minimalistic design does not hinder your space or work. The bag is made of durable quality polyester, and it includes three portion-control meal boxes. There is an insulated beverage bottle to keep your beverages such as tea, coffee or even cold shakes at their ideal temperatures. All the boxes and the bottle are spill proof. Do not worry about leakage while you carry them. The boxes are made from BPA free food grade plastic material. They are completely re-usable. Just clean (wash) them and use them. The boxes are safe to use in microwave, freezer, and dishwasher. A2S provides a single of cutleries along with the package. They are not any flimsy plastic set but a durable stainless-steel one. You can use them as long as you want. As the set includes everything a user wants, you can carry it to anywhere such as gym, vacation, work, university, school, and anywhere you desire. It will be of full assistance when it comes to meal management. 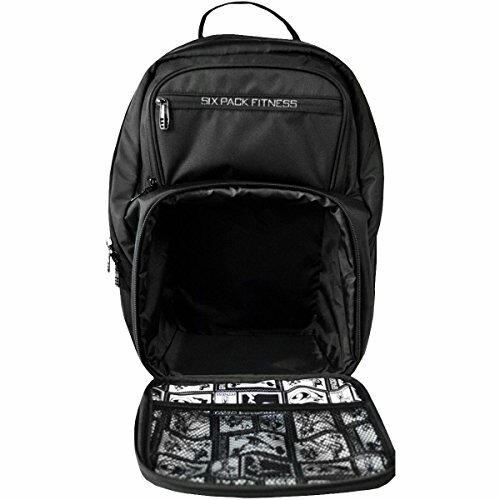 The meal prep bag from Fitpacker is not just a meal prep bag. It includes every necessary thing a meal prep bag must have. 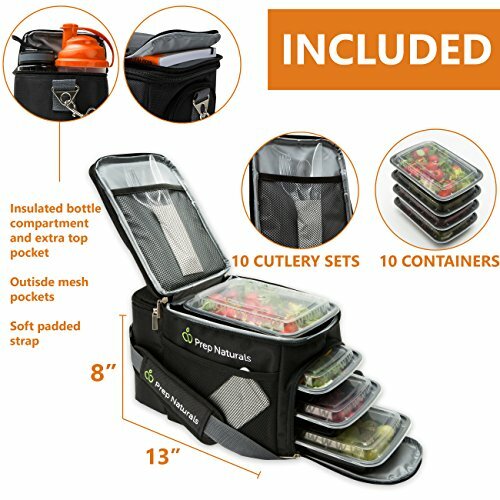 This meal prep bag consists of a fully insulated bag along with four Fitpacker’s original 28oz meal boxes. The bag is designed perfectly to hold your food fresh. Its fully functional insulated cooler bag will help you keep your food cold and fresh for more extended periods. The bag is made from a durable 600D polyester which does not attract stains. On the inside, the bag has a nylon layer to insulate the food you carry. To keep you hydrated there is an adjustable side bottle holder which can carry 32oz water or shaker bottle. The side mesh can also be used to carry an extra bottle, or you can store your favorite energy bars. An extra pouch on top of the bag helps you store your accessories such as power banks, keys, or even cutleries. It has everything needed and is suits best for travelers, gym goers, or even for your office. For easy carrying, there is a shoulder strap and also a handle. You can use either of them according to your convenience. The final product on our list is the Lish meal prep bag. It has six portion-controlled meal boxes along with a superior quality insulated bag. All the boxes have a snap lock lids. For keeping your food fresh for more extended hours, Lish includes a reusable icepack. The set also contains a vitamin organizer box. With the portion control system, you can easily organize your food and maintain a healthy diet plan. There are two side mesh pockets which help you to carry water or your favorite protein shaker bottles. This bag has enough space and accommodates enough number of boxes to carry food required for your entire day. Thought the ice pack serves the purpose it is recommended to purchase an additional one if you are planning to store it for longer periods. The shoulder strap makes it easy to carry this meal prep bag. It also has a top carrying handle which is detachable. Its authentic and straightforward design is ideal for every user who wishes to carry larger amounts of food or to store for prolonged durations. For a healthy lifestyle, meal prep bags are essential. They are not just meant to store your food or as used as a carrying mule. 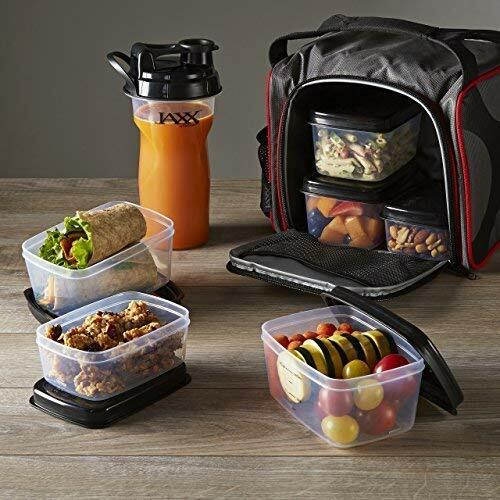 These meal prep bags help you stay healthy because they prevent you from unhealthy eating habits at your workplace or wherever you go. They also help save your money too. To start with a meal prep bag can be daunting but here is a guide about specific things to consider before buying meal prep bags. The primary function of these meal prep bags is to keep your food well insulated. Be it a cold item or a hot one; they must be able to hold their ideal temperatures from the time of storage to the time of consuming. A minimum of 4 hours is required for the bag to keep your food fresh. But note that insulation mechanism does not solely depend on the type of bag you purchase. It also depends on the meal boxes too. A well-insulated bag which has PEVA lining and EPA foam (together or alone) is ideal for storing your food. Some bags use nylon lining to preserve the food. Although the nylon layer insulates the food, it cannot withhold for prolonged periods. Similarly, if the meal boxes are made durable materials and have an excellent airtight mechanism, it adds an extra layer of insulation to your food. Before buying a meal prep bag understand your need. If you want to use it at your work, it will be awkward for you to carry a huge bag which is the size of a travelers bag. Most meal prep bags are compact and simple. But there are certain exceptions where they are designed to suit a separate set of people such as travelers or gym enthusiasts. These bags will be significant and are ideal to fit multiple boxes to carry food for an entire day. You must also consider the size of the boxes too. Certain boxes have portion control system while some don’t. If you are health conscious or on a diet plan, a portion-controlled box is a better choice. The meal prep bags must be easy to carry anywhere you want to. They must include a shoulder strap or handle or even both. Some of them are designed in the form of a backpack for easy carrying. Even these shoulder straps and handles must be wide enough to carry them without hindrance. Consider which type will suit your lifestyle and purchase accordingly. Quality of the materials used in manufacturing any product will decide its future. 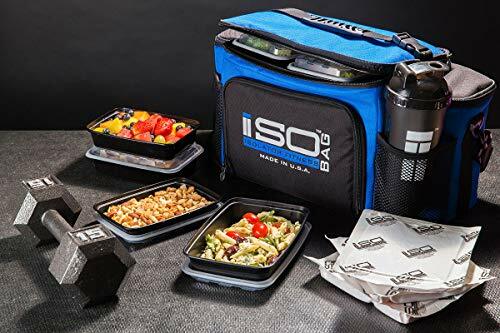 The durability, longevity, and functionality of the meal prep bag depend on how good the materials are used in their design. A good bag is made of a superior quality polyester. There are many types of polyester used for these bags, but the most common ones are 600D polyester and EnduraPoly. These materials are well known to be dust and stain resistant. They are also durable and will last for many years. Coming to the boxes, almost all boxes are made by using food grade plastic. They are also BPA free. You can use them safely in the microwave, freezer, and dishwasher. A good company will provide all the three. You may get a limited warranty or lifetime warranty depending on the company, but either of them is an excellent perk to consider. If you are unsatisfied with the product, there should a refund or replacement policy. Consider if this feature is available or not. You can get these details by contacting the respective customer support. Other minor features you can (not a must) consider before buying a meal prep bag is the appearance and color choices. Some of them premium looks while some of them are simple and minimalistic. While few companies provide different color options, it is purely subjective which one you choose. You can buy a fancy colored meal prep bag or a simple unisex bag with a single-color option. Most often people opt to buy a larger meal prep bags without understanding the different types of them. As stated earlier, you have to select an appropriate bag which perfectly fits for your lifestyle. There different types of meal prep bags and knowing them will help you select the best one. The full meal bags are ideal for those who want to store food for an entire day or more number of people. Usually, they contain three to four full size (generally 28oz) boxes suitable for adults. This is ideal for those who stay at work for a longer duration or for those who travel a lot. These types of boxes are larger and make sure if it fits your requirements before buying. These bags are suitable for carrying small portions of food. They are most ideal for kids. Even adults can use them if they are looking for quick meal bags. These bags can accommodate small size boxes but with a note that with an additional number of boxes, you can carry a full meal. It is suitable for a one-time lunch (or dinner) at your office/work. It is no wonder to carry your favorite protein shake with your meal prep bag. These shakers or jars are handy and can be a great addition to your meal. It perfectly suits for athletes and gym enthusiasts. You can carry your favorite beverage with these bottles. They are easy to clean too. It is obvious that there are many product choices available for when you are looking for a product to buy. It is always a good habit to do a little research, read reviews, dig into the company’s website to analyze how good the product is. Well, we made that task easier for you. After hours of research, considering all the factors here is the list of top-rated meal prep bag brands available out there in the market. The name of the company indicates that it is evolving their products to meet the demands of their customers. Evoultionize is a leading manufacturer of meal prep bags. Its products are durable and are known for their versatility. You will not be disappointed with the purchase, and on top of it, the company promises 100% customer satisfaction. The unique feature of Evolutionize meal prep bag is its triple layer insulation. It keeps your food fresh for more extended periods without affecting the quality. Hailing from Great Britain, ThinkFit had a tremendous impact on athletes. Initially, they used to manufacture fitness products since 2012. Since the meal prep bags are a part of athletics and gym goers, they stepped up in producing these products too. Their motto is that the users must follow a healthy diet especially when you set specific goals such as weight gain or loss. Another unique feature of their product is the portion control system. With portion control, it is easy for the user to have a controlled diet and achieve their goals. The name of the company is enough and does not need any description. But for enthusiasts like you, Fit & Fresh aims to keep you fit by keeping the food fresh. The unique feature of their product is their patented shelving system. On the shelves in the bag, you can store and take out the meal boxes without removing others. These shelves will act independently. Another characteristic feature is their JAXX shaker. It blends your protein powder to provide smooth shakes. Another meal prep bag designed to suit athletes is the 6 Pack Fitness bag. The name itself is symbolic to promote a healthy lifestyle for its customers. It is also suitable for regular users too, don’t get fooled that it is designed for a specific class of people. But it is designed with a motto to promote health. It is a simple bag with lots of space to store large or full-size meal boxes. The package also includes an ice pack system which can keep your food fresh for more than 8 hours. It is ideal for athletes, office workers, and travelers. How to Clean and Take Care of Your Meal Prep Bag? It is apparent that you carry different types of food each day. All these foods are made of different materials, and some may cause stains with their natural colors. Even oil can create a fat layer of stain inside your boxes. Oh yeah, even your bag can catch these stains. No matter how strongly a company promises about their ‘stain free’ materials, don’t believe them. They will, of course, catch the stain. It just varies in their levels. The stain-free elements will not get dirty as quickly as their counterparts do. For cleaning the bags, you gently hand wash them with a mild liquid detergent. If you doubt if the bag is detergent washable or not you can use plain lukewarm water. Clean the bag under running water to clean the stains. Don’t machine wash them. It will damage the insulation and other protective layers of the bag. Another method of cleaning is the use of vinegar, lemon, and baking soda mixture. Although it is not always required, you can follow this method for stubborn stains. Mix one teaspoon of baking soda with 5 to 10 ml of lemon juice. Apply this mixture to the stain and leave for at least 20 minutes. After that with a brush apply vinegar and scrub the stain gently. It will remove the stain effectively, and you can wash away the vinegar under running water. The meal boxes are easy to clean. You can hand wash them with liquid detergents, or you can follow the same lemon-vinegar-baking soda procedure. Most of these boxes are dishwasher safe, but hand cleaning is safe and will not cause any physical damage. Follow hand washing method so that they will last longer. Q. What is PEVA, EPA, and BPA? PEVA is a material used in the manufacture of meal prep bags. It is a short form for Polyethylene Vinyl Acetate. It is a non-chlorinated vinyl which subsequently replaced PVC (Poly Vinyl Chloride). It does not cause any health hazards like other materials. EPA stands for the Environmental Protection Agency. It is an independent agency focused on protecting the environment and nature. So, if your product description says EPA-registered, it means the product in no form will cause harm to quality. BPA means Bisphenol A. There is a debate between the different scientific communities regarding the effects of BPA on human health. It is widely used in the manufacturing of plastic products, and it is more commonly used in water and cold beverage bottles. Some claim that BPA can dissolve itself into the drinks or foods which will result in severe health hazards. BPA free products do not include it, and it is better to select BPA free meal prep bags. Q. What is the minimum duration that a meal prep bag holds the food fresh? Most of the meal prep bags will hold your food at their desired temperatures for a minimum of 8 hours. Q. 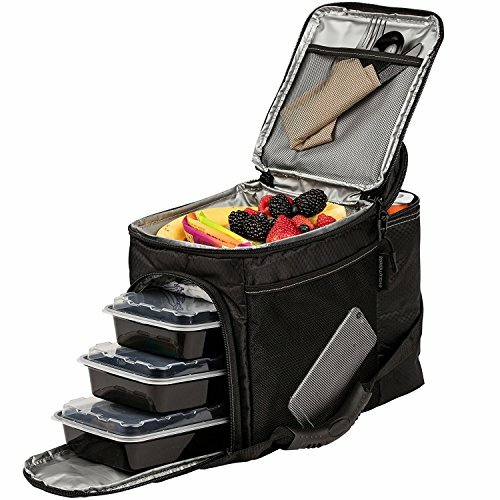 How to select an ideal meal prep bag for me? It depends on your requirements and your lifestyle. If you intend to carry it to your office, select a compact and smaller meal prep bag. Athletes and travelers can use larger meal prep bags that support bigger boxes and are easy to carry. Q. Can I use these boxes in freezer or microwave? Most of these boxes are microwave and freezer safe. Read the description of the product before using it. You can also check on the bottom side of the boxes about the information regarding the same. Note that some boxes should be used in the microwave without placing the lid. Although it is advised not to use the cover even if it is safe to use, make sure you follow their instructions. Q. How do I clean these boxes? Simple hand washing with a liquid detergent or dish wash bar will suffice. Some of them are dishwasher safe too. Having a meal prep bag doesn’t justify that your task is done. You have to prep your meal accordingly. Pick a day for this task. Most people do this on weekends, but it is purely subjective. But, make sure you pick a day and stick to it regularly. Make a list of items to be prepped for your entire week on your pre-fixed day. A balanced diet which consists of proteins, veggies, carbs, and healthy fats will keep your body healthy. Make sure you prepare different types of foods. Consuming the same food every day may not appealing for your tongue. Do experiments, mix up your spices and other ingredients. It will always be interesting when you keep experimenting with your food. Don’t forget to stick to your basics. Keep your favorite proteins (shakes or foods), veggies, energy bars, and other healthy items always at your disposal. Finally, portion your food and assemble them in your meal prep bag. By using best meal prep bags your healthy days will follow.